Since my wedding is this week and has some geeky 8 bit elements, I decided the outfit for this week should also match that theme! This Tetris swimsuit was my main inspiration, and the rest came together from stuff I either had, made, or got from Etsy. Now, I went very nontraditional when it came to the top I picked out. 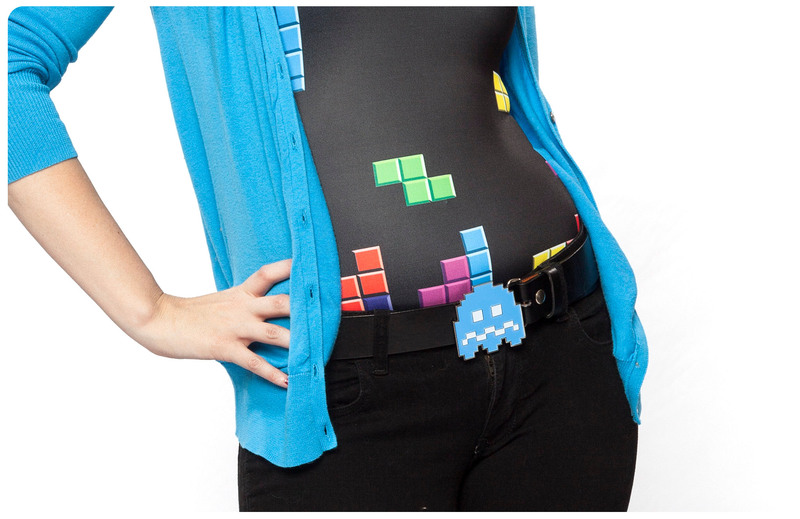 I had fallen in love with the Retro Gamer swimsuit from Black Milk Clothing and wanted to find a way to wear it without always going to the beach or pool. While Black Milk doesn’t always carry geeky items, they do have a great collection of swimsuits, and hopefully with be debuting their Star Wars collection very soon! In the mean time, check out this older post for geeky swimsuit ideas. I primarily picked this cardigan to wear because it matched so well with some of the Tetris pieces, and happened to match my belt buckle as well. Even though I could make everything super geeky, I like pairing in some regular pieces to even things out. This cardigan was a gift, but I usually shop at places like Old Navy to get solid color pieces to mix and match with my outfits. Since I had a lot going on up top, I decided to keep my bottoms a little more simple and went with black skinny jeans. You could also wear shorts or cutoffs for an outfit to wear at the beach. I just paired this outfit with some simple heels. It might be fun to switch things up and pair it with either some flats or maybe some custom painted shoes like these. This outfit is definitely all about the accessories. 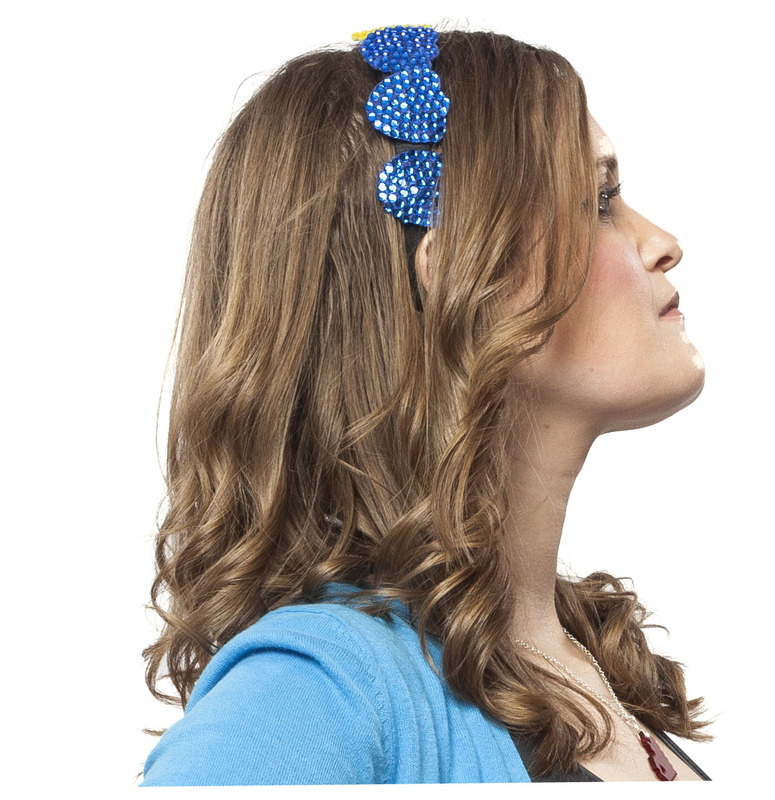 The headband is from this DIY Friday post. I love it because you can easily change it around depending on your mood or outfit. It also says 8 bit and Pacman without being too in your face. If you don’t want to craft your own, you can always go the Etsy route and pick up something. I bought the 8 bit heart necklace on Etsy from House of Darkly. There’s a great trend right now with laser cut acrylic jewelry, so finding something that is not only geeky but looks good is super easy. I also liked the fact that this particular seller offered me a choice of a chain or cord. I actually got the Pacman Ghost belt buckle from a friend a couple of years ago, and had all but forgotten about it until I was putting together outfit ideas. I loved the fact that this blue happened to match both my cardigan and Tetris swimsuit. I’m not sure where he bought it from, but this website has a great selection and Amazon is a good source as well. As always, we love when you guys share your geeky outfits with us on our Facebook Page. I have to say, since putting together these looks, I’m a bit obsessed with coming up with new ideas or finding great pieces for new outfits. I hope these posts are inspiring you to think out of the box and put together something great of your own. Until next time!